“Most of us do not sit well, and we’ve certainly been putting a lot more stress on our spines,” says Khan, who operates on spines at Sutters Health’s Palo Alto Medical Foundation. If we change the way we sit, Khan says, it will help to decrease back problems. “We should sit less, and we should sit better,” he says. Over the past century or so, many Americans have lost the art of sitting, he says. Most people in the U.S. — even children — are sitting in one particular way that’s stressing their backs. You might not realize you’re doing it. But it’s super easy to see in other people. 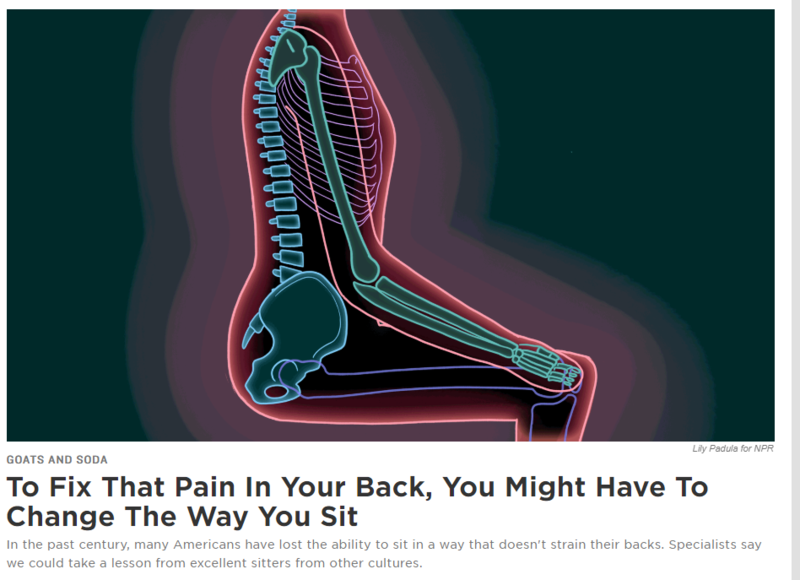 Here’s how: Take a look at people who are sitting down – not face-on but rather from the side, in profile, so you can see the shape of their spine. This entry was posted in General Health and tagged back pain, sitting by gutsandgrowth. Bookmark the permalink.